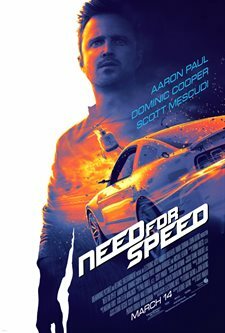 Tobey Marshall (Aaron Paul), a blue-collar mechanic who races muscle cars on the side in an unsanctioned street-racing circuit. Struggling to keep his family-owned garage afloat, he reluctantly partners with the wealthy and arrogant ex-NASCAR driver Dino Brewster (Dominic Cooper). But just as a major sale to car broker Julia Maddon (Imogen Poots) looks like it will save Tobey's shop, a disastrous race allows Dino to frame Tobey for a crime he didn’t commit, and sending Tobey to prison while Dino expands his business out West. Download Need For Speed in Digital HD from the iTunes store. Need For Speed images are © DreamWorks Studios. All Rights Reserved. Can't wait want to see it so bad.